Nothing quite soothes the soul like the sound of burbling water. Even though we have a long and narrow backyard, we always wished we had room for a small water garden. The opportunity arose when we decided to remove some shrubbery that was past its prime. We did some online and in-store homework on ponds and discovered there are numerous construction options. The first option is pouring a concrete shell similar to an in-ground swimming pool, but this can be very expensive. 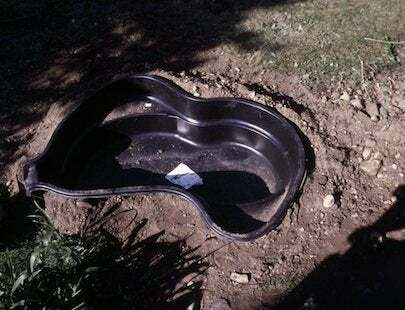 The second is buying a puncture-resistant, vinyl liner similar to an above-ground swimming pool. Available in widths ranging from 5 to 50 feet wide, these liners allow you to play the role of landscape designer and create a free-form pond, as deep and as wide as you like. We rejected this idea because it was a bit too complex and labor-intensive for the size of our area. 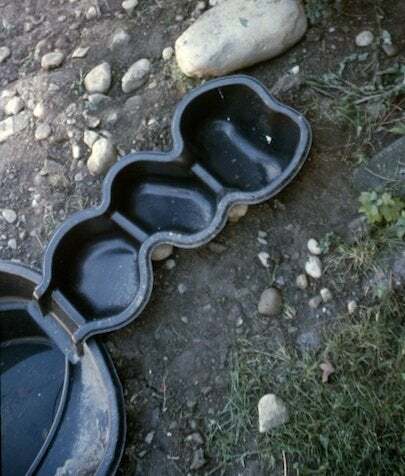 A third option is pre-formed fiberglass shells, offered in a wide range of shapes and sizes, including such designs as waterfalls and cascading pools. These were perfectly suited to our needs, budget, and experience level! We purchased two: a large, kidney-shaped shell with a 300-gallon capacity and a three-section cascading pool shell. We also purchased a pump and filter combination (with a capacity of 500 gallons per hour), 20 feet of flexible tubing, and a fountain spray head. 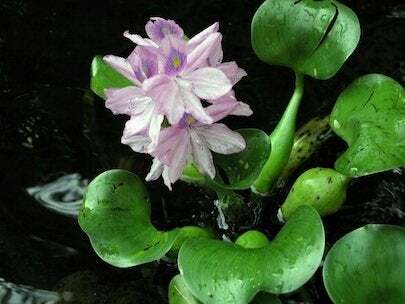 Even in a small pond, a pump and filter are essential to keep the water clear, filtered, and moving. Standing, stagnant water is ugly, smelly, and can be a breeding ground for mosquitoes. 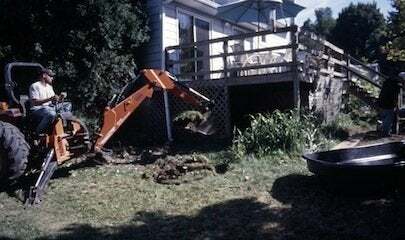 We contracted with a local landscaper to dig up the old shrubs and “rough out” a hole for the pond, then shaped the edges and leveled the bottom. We lined the hole and the surrounding area with a mesh barrier fabric to prevent weeds. Next, we purchased five 50-pound bags of sand, which we then used to cushion the bottom of the pond shell. The edges of the shell were covered with large, irregular slabs of slate, while ferns and decorative grasses were planted to create a more naturalistic landscape. The next step was installing the cascading pools. We wanted to produce a waterfall effect, so we built a platform of stones and nestled the cascade shell into the stones on an angle. We placed more stones inside the shell to enhance the illusion of a natural waterfall. Best of all, the stones gave us the added benefit of hiding the flexible tubing, which runs from the pump up to the top of the waterfall. Finally, we planted a small hemlock tree, along with several rhododendrons, irises, and azaleas to flank the waterfall. 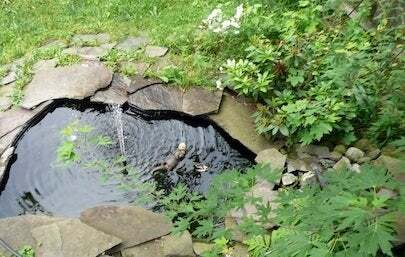 We filled the pond, turned on the pump and spray fountain, and settled down to enjoy the effervescent flowing water, our own little oasis of calm in a hectic world.